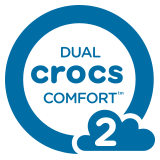 Here’s a great casual look that gets you around town in style with Dual Crocs Comfort™ inside. It starts with the genuine suede uppers with tassel detail — a laid-back look that pairs up with your favorite fall outfits. Inside, there’s a soft foam footbed on top of a cushioning Croslite™ foam midsole and rubber outsole for a smooth ride.